The Jerusalem cross represents a blending of the Crusader's Cross with the Greek or Tau Cross. It also represents the Knights and Dames of the Holy Sepulcha of Jerusalem. The Jerusalem Cross was first used as a coat of arms for the Latin Kingdom in Jerusalem. During the Crusades, it came to symbolize the "Crusader's Cross". The four small crosses in the design represent the Four Gospels proclaimed to the four corners of the Earth, which began in Jerusalem. The larger cross symbolizes the Person of Jesus Christ. The Tau cross represents the last letter of the Hebrew Alphabet, with its version transcribed in Greek as a "T". Available in 8mm, 9mm, and 10mm widths. Also available in white gold, yellow gold, rose gold, and platinum, shown below, as well as 18k gold. This unique Celtic ring is made using Diamond Engraving methodology, the best known method for fine-line detailing on metal surfaces, such as gold, for long lasting and durable engraving and designs! 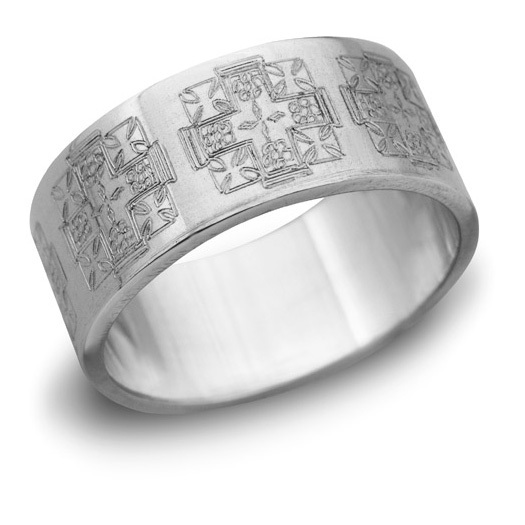 We guarantee our Sterling Silver Jerusalem Cross Wedding Band to be high quality, authentic jewelry, as described above.